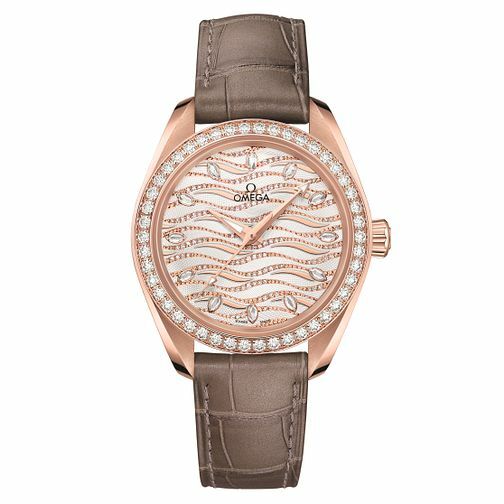 Attractive and perfectly practical, this Aqua Terra ladies' timepiece boasts a waved opalescent white dial composed of 138 set diamonds, embellished with a further 12 marquise cut dazzling diamond hour markers, upon an 18ct rose gold tone case with a set stone embellished bezel. Heavily inspired by the ocean, this Seamaster watch features rose gold plated hands which move with precision upon this Swiss made chronometer-certified creation. Finished with a chic brown leather strap, the Aqua Terra is a versatile and contemporary timepiece.